Two Hello! Project tackle the same twenty questions about idols and fandom! Who survives? Who doesn’t? Well, they both survive, it’s not like a knife fight or anything. Akanishi Jin and Kuroki Meisa in a shotgun wedding! More reactions to the arrest of Takamina’s mother! And introducing from Korea… SPEED? All this, and much more! 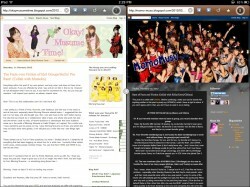 Reviews of PVs from S/mileage, Hey! Say! JUMP, and Alice Juban! Morning Musume releases a stopwatch app! Shirota Yuu releases debut album! And more! Is Morning Musume a sinking ship? Is Hello! Project in general going the wrong direction? And what exactly are O-Parts and how does a Kanjani8 stimulate it? And… much more! Nakanomori Ayako returns! SKE48 hit record sales for a sister 48 group! Restaurant owner speaks up about the Sohee / Seulong rumors! And more!